DESCRIPTION RxLink Balanced Meal Complete is a plant-based complete nutritional shake that contains a complete formulation of nutrients to provide for a nutritious shake or meal replacement. 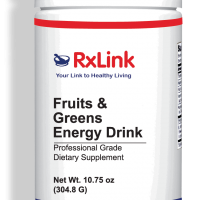 RxLink Balanced Meal Complete features organic fermented whole foods, five plant proteins, five organic supergains, essential fatty acids, probiotics, digestive enzymes, and 25 fruits, berries, vegetables, and herbs. It is a high-protein, low-fat, and low glycemic means to supplement or replace a meal. FUNCTIONS Liquid nutrition utilizing protein based powders has been recognized as having immense value in providing a sound nutritional foundation for individuals. Liquid nutrition offers several advantages over solid food for the uptake of vitamins and minerals. Unlike solid food which requires specific digestive enzymes and stomach acids for digestion, liquid nutrition does not. Liquid nutrition allows for specific nutrient targeting for specific disease states. Liquid nutrition can provide measured nutrient intake so that calories, sugar, sodium and other variables found in conventional nutrient sources can be standardized. Finally, liquid nutrition can provide a sound nutritional foundation for health challenges such as weight loss, muscle recovery, wound healing, diabetes management, hospice care, bariatric surgery and many health issues. 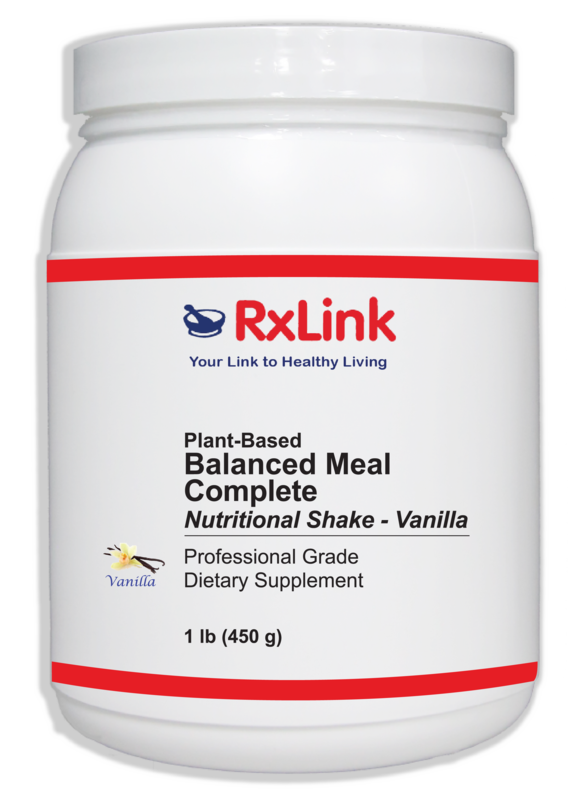 Rxlink Balanced Meal Complete is a plant-based complete nutritional shake containing a complete formulation of nutrients in a nutritious shake or meal replacement drink. To begin, Balanced Meal Complete features 21 vitamins and minerals from organic fermented whole foods. This vitamin/mineral matrix provides an easily digested and bioavailable nutrient source. RxLink Balanced Meal Complete features a fortified plant protein matrix with biological value similar to animal proteins such as whey. Each serving provides 17-18gm of complete protein from pea protein, organic sprouted amaranth, organic sprouted quinoa, chlorella, cranberry, and additional BCAA’s. Next, RxLink Balanced Meal Complete includes a plant energy matrix of soluble fiber which significantly slows the uptake of carbohydrates and prevents the sugar high and crashing associated with simple carbs. This plant energy matrix has a low glycemic response and provides extended energy release, helping to maintain healthy glucose and insulin levels. RxLink Balanced Meal Complete contains antioxidants obtained from 25 fruits, berries, vegetables, and herbs. These antioxidants help to protect the body from free radicals and other toxic compounds, and provide protection against inflammatory related cell damage. Antioxidants have been shown to prevent oxidative damage to lipids, as well as reduce arterial plaque formation. Organic acacia gum provides 5 gm of fiber per serving. The plant based Essential Fatty Acid (EFA) matrix found in RxLink Balanced Meal Complete features essential fatty acids from flax, chia, hemp, and Sacha Inchi. 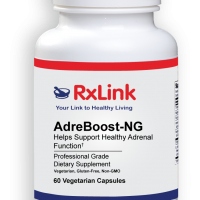 The probiotic, prebiotic and digestive enzyme components of RxLink Balanced Meal Complete enhance the absorption of proteins, fiber, complex carbohydrates and healthy fats. Specifically, this product contains 1 billion viable cells of Bacillus coagulans probiotic, along with prebiotic nutrition from inulin. Digestive enzymes incorporated into the formulation include bromelain, protease, amylase, cellulose, lactase, lipase, and alpha galactosidase. RxLink Balanced Meal Complete provides a high-protein, low-fat, and low glycemic meal replacement with more available nutrition than a typical meal. INDICATIONS As a dietary supplement, Balanced Meal Complete can be used to provide a complete nutritional shake or meal replacement option. 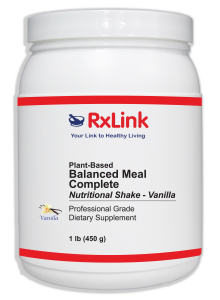 RxLink Balanced Meal Complete is a plant-based complete nutritional shake containing a complete formulation of nutrients in a nutritious shake or meal replacement drink. To begin, RxLink Balanced Meal Complete features 21 vitamins and minerals from organic fermented whole foods. This vitamin/mineral matrix provides an easily digested and bioavailable nutrient source. RxLink Balanced Meal Complete features a fortified plant protein matrix with biological value similar to animal proteins such as whey. Each serving provides 17-18gm of complete protein from pea protein, organic sprouted amaranth, organic sprouted quinoa, chlorella, cranberry, and additional BCAA’s. Next, RxLink Balanced Meal Complete includes a plant energy matrix of soluble fiber which significantly slows the uptake of carbohydrates and prevents the sugar high and crashing associated with simple carbs. This plant energy matrix has a low glycemic response and provides extended energy release, helping to maintain healthy glucose and insulin levels. 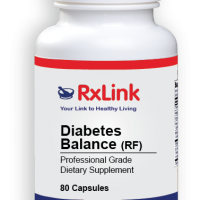 RxLink Balanced Meal Complete contains antioxidants obtained from 25 fruits, berries, vegetables, and herbs. These antioxidants help to protect the body from free radicals and other toxic compounds, and provide protection against inflammatory related cell damage. Antioxidants have been shown to prevent oxidative damage to lipids, as well as reduce arterial plaque formation. Organic acacia gum provides 5 gm of fiber per serving. The plant based Essential Fatty Acid (EFA) matrix found in Balanced Meal Complete features essential fatty acids from flax, chia, hemp, and Sacha Inchi. The probiotic, prebiotic and digestive enzyme components of Balanced Meal Complete enhance the absorption of proteins, fiber, complex carbohydrates and healthy fats. Specifically, this product contains 1 billion viable cells of Bacillus coagulans probiotic, along with prebiotic nutrition from inulin. Digestive enzymes incorporated into the formulation include bromelain, protease, amylase, cellulose, lactase, lipase, and alpha galactosidase. Balanced Meal Complete provides a high-protein, low-fat, and low glycemic meal replacement with more available nutrition than a typical meal. 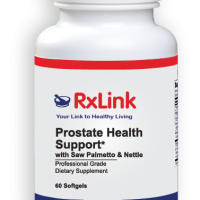 INDICATIONS As a dietary supplement, RxLink Balanced Meal Complete can be used to provide a complete nutritional shake or meal replacement option.